On this page, you can find out what's been happening in our parishes. To see future events, please see our fundraising page. After seven years at St Joseph's, Fr Bill celebrated his last Masses as Parish Priest on Easter Sunday. Fr Bill will be missed by parishioners of St Joseph's along with staff and students at Blessed George Napier and St Joseph's schools. We wish him a very happy and blessed retirement and give thanks for all Fr Bill has done throughout his priestly ministry here in Banbury. Angelus Cantans performed a concert at St John’s Catholic Church, Banbury on Sunday evening. The choir were young people from the High School and the Junior High School of Glubczyce, southern Poland. The first half comprised mainly sacred music in both Polish and English, including An Irish Blessing and Good News. The second half was lighter and included Nothing’s Gonna Change My Love for You, Goodnight Sweetheart and Can’t Help Falling in Love with you. The choir sang beautifully and there was a standing ovation from the audience, with many commenting that they could sing in any Cathedral. Many thanks to the Polish Association of Banbury, Rugby and Leamington for organising the concert and helping to raise £500 for the St John’s Stained Glass Windows Appeal. We hope that the choir will return to England and come to sing for us again. ​Parishioners from St Joseph's and St John's made a pilgrimage to the National Shrine of Our Lady. They had an early start as they made their way to Walsingham in Norfolk. The pilgrims attended Mass in the shrine and made the walk along the Holy Mile praying the rosary. With time for to explore the shrine and offer their personal intentions to Our Lady. The pilgrims also prayed for our parish communities here in Banbury. Thank you to Sue and Deacon Henry for organising a great pilgrimage. ​Thank you to Mrs Rosemarie Higham-Stevens, who on Sunday 23 July kindly opened the garden at Cherry Lodge, Shotteswell, formerly the home of John Profumo and Valerie Hobson. The weather was kind and the event raised £226.00. Thank you to all who came. Parishioners from St Joseph's and St John's, as well as children from St Jospeh's school, held their annual shoebox appeal to fill shoeboxes with items like sweets, pens, pencils, hats, scarves, gloves and toys. An amazing 114 boxes were collected and will be sent to needy children. Thank you to Sue Allen and to all who have contributed to the box collection. A very interesting and informative evening was held in the Dupuis Centre. Yolanda Tapping gave a cooking demonstration, showing everyone how to cook some Malaysian dishes. The delicious aromas whetted the appetite of all those who attended, who were able to sample the dishes whilst enjoying a glass of wine. £484 was raised on the night. Thank you to Yolanda and all those who assisted in hosting this enjoyable event. The annual quiz, with Fish & Chip supper, raised nearly £400; as usual, it was won by "Guns 'n Roses". The questions were, according to some, very very hard! Thank you to all who organised the evening and all those who attended. A very good evening was had, as we raised £1758.96. A variety of items were auctioned off, from holiday cottage lets to maths lessons. Thank you to everyone who donated lots for the auction and we hope that everyone is happy with their purchases. We look forward to being able to share with you how Fr Richard got on with his squeeze-box lesson! The Hispanic Community of our parish organised a wonderful evening at BGN School, with authentic Spanish food. We were entertained with some live music and a display of Salsa dancing; everyone was encouraged to practice their dancing skills. An excellent £1818 was raised towards our windows fund. A big Thank You to all who were involved in organising the evening, and to those who donated the food. Fr Craig returned to St John's to celebrate Mass with us. to give thanks for his ministry here in Banbury. Though Fr Craig was a bit nervous (he wasn't sure why!) it was a wonderful celebration and a great opportunity for us as a parish to say thank you for all he did for us here at St John's during his time here. We all know that Fr Craig will be a great Parish Priest but please remember him in your prayers and his new parish of Our Lady of Fatima, Quinton. At 12.00 noon on Saturday 16th, the Ordination Mass began at St Chad's Cathedral in Birmingham. It was a wonderful Mass celebrated by His Grace, the Archbishop and was attended by family, friends and parishioners of Fr Chris Yule (our new assistant priest), Fr Tomas Zuna and Fr Simon Baker. Fr Richard and Fr Craig were both present to welcome the three new priests into the presbyterate of the archdiocese. Fr Chris celebrated his first Mass on Sunday in his home parish of Holy Name, Great Barr in Birmingham. Fr Craig received his first blessing after this Mass. We keep them in our prayers as they begin this new ministry. A group of parishioners, who are regulars at the Monday Lunch Club, went on a fantastic parish trip to Windsor: on arrival, they went on a river cruise on the River Thames, and enjoyed a delicious Ploughman's lunch on board. They then visited the Castle, where they enjoyed the spectacle of this historic site. A piano concert, performed by Marcin Dominik Gluch, was held at BGN School on Sunday evening. This was organised by the Banbury Polish Association. It was a mixed programme of Polish, British and American composers. The evening began with traditional Polish food, prepared by members of the Polish Community. This event raised £320, which was kindly donated to our window restoration fund. Our first parish summer fete began at 11.00 am in the Dupuis Centre car park and presbytery garden on Saturday 25 June. Despite our usual British summer weather, people were undeterred and came along to support this event. There was entertainment by two dance groups, a BBQ, cream teas, a variety of stalls and face-painting, amongst other things. Thank you to everybody who helped in any way to make this such an enjoyable event. We raised £1257.71, towards our window fund. On Friday 27th May, members of the parish led by Fr Richard travelled on pilgrimage to Lourdes as part of the annual Archdiocesan pilgrimage. Fr Craig accompanied 31 sixth-formers from BGN on the pilgrimage too. It was a truly prayerful week, and a wonderful experience to pray at the shrine of Our Lady and to celebrate the numerous liturgies throughout the week. During the week there was also an opportunity to walk through the Door of Mercy. 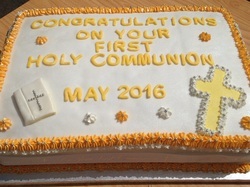 At 10.00 a.m. on Saturday 7th & Saturday 14th May, we celebrated the parish First Holy Communion Masses at St John's. Children from St John's Catholic Primary School, and members of the parish First Holy Communion group came together to celebrate this Sacrament for the first time. Both Masses were joyful celebrations, and the Thanksgiving Mass on Sunday 15th May was an opportunity for the parish to celebrate with them. During the thanksgiving Mass, the children received their First Holy Communion certificate, as a reminder of this momentous moment. For one night only, the Dupuis Centre was transformed into a candlelit restaurant to help raise funds for our window restoration. 59 parishioners enjoyed a 3 course meal in the transformed Bowen Room. A massive "THANK YOU" to everyone who helped to make this such an enjoyable event. The evening raised £1420.20! 2016 is an year to celebrate at Saint Joseph's Primary School. This year they celebrate their 50th Anniversary. On Friday 29th April 2016, Fr Bill celebrated Mass in the school hall with the children, staff, governors and invited guests. It was a joyful celebration for all. Congratulations to everyone at St Joseph's School! The Easter Vigil in both parishes was a moment to truly rejoice this year - as we welcomed the members of our RCIA course into the Catholic Church. We continue to keep them, and their families in our prayers. Despite the weather, the Easter Vigil was a wonderful celebration. Thank you to everyone who worked so hard to prepare for the Triduum celebrations. Here are few photographs from the Sacred Triduum. 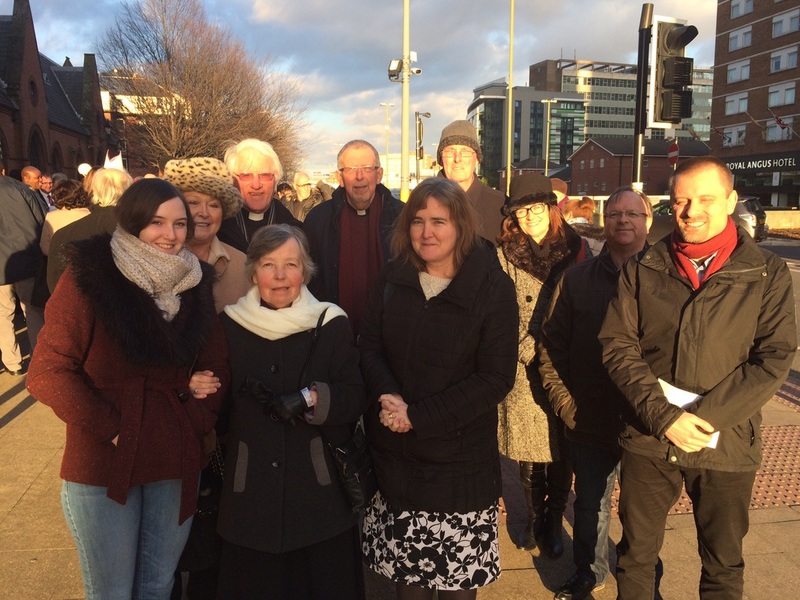 It was wonderful to gather at St Chad's Cathedral in Birmingham with people from around the Archdiocese for the Rite of Election on Sunday 14th February. The Cathedral was filled to overflowing with candidates and catechumens preparing to be Received into the Catholic Church, or be Baptised this coming Easter. We keep those from our two parishes in our prayers particularly over the coming weeks of Lent. May God continue to bless the abundantly in their Journey of Faith. It was wonderful to welcome His Grace, Archbishop Bernard Longley to St John's for this year's Confirmation Mass. During the celebration, over 60 children received the Sacrament of Confirmation. Some were from St John's Catholic Primary School, some from Tudor Hall Girls' School, and some from the parish group. Thank you to everyone who was involved - those who prepared the children, the musicians, the choir, the parish office, and the ladies who help with the refreshments. It was great to mark this momentous day in such a joyful way. We keep the children, and their families in our prayers. On Monday 14 December, the parish hosted Christmas lunch for the over 65s Monday lunch club. Lots of parishioners and friends joined us for the traditional Roast Turkey with all the trimmings. After the meal, the choir from Blessed George Napier secondary school came and provided entertainment with Christmas carols. A wonderful time was had by all, and huge thank you to the elves who cooked dinner!